Topics: Flexible Printed Circuit, Pcb Assembly Equipment, Printed Circuit Board Manufacturing, Flexible Printed Circuit, Assembly, and Printed Circuit Board Manufacturing. Age: It went live on August 27th 1998, making it over 19 years, 7 months old. 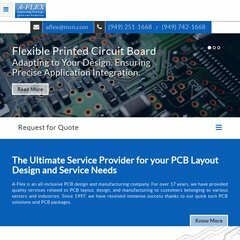 a-flex.com Flexible Circuit Boards, Flexible Printed Circuit at A-Flex ..
a-flex.com Contact us - A-Flex.com - PCB Manufacturers, PCB Layout Service .. The estimated 54 daily visitors, each view 1.90 pages on average. A-flex.com's IP address is 98.136.92.79. ns9.san.yahoo.com, ns8.san.yahoo.com, and yns2.yahoo.com are some of its 4 Nameservers. Yahoo Inc (California, Sunnyvale) is the location of the YTS/1 server.